That damn cat, though. Seriously. ItsI amazing that I managed to log in to this account on my phone in the first try. It took 2 days to remember my Reddit password and I still haven’t gotten into Twitter. Guess I’ll buy a new laptop tomorrow, but I’m not happy about it. Also not happy about blogging on my phone. After 3 days of sliding around a 1.5″ x 2.5″ keyboard, it’s time to concede defeat. I gotta have a real machine. This entry was posted in comic and tagged angry, Bad kitty, cat, comic, Computer, Destruction, Laptop, rage on July 20, 2018 by littledragonblue. You might think it’s about you. But it’s not. It’s about me. Radical self care. For me it tends to take the shape of being incredibly selfish. Sometimes it seems like something I don’t get to do very often, but on the other hand, drawing webcomics is incredibly selfish in many ways. It’s absolutely all about me. My art has always been all about me. The difference is, it used to be novels that a half dozen people read, and now it’s comics that 100s or 1000s of people read. But they’re still about me, my life, my experience, what I’m going through. Even if they seem political or altruistic, even when I do something like the Patricia Jabbeh Wesley comic the other day, or all those Bonnie Jo Campbell comics, I’m still in it. It’s still about me. My brother told me yesterday that my comics were getting very dark. I say the world is getting dark. The comics just reflect my perception of it. But actually, I’ve been taking great care of myself since the election. Not, of course, as good as my kitty, Lupin (pictured above). We could all take lessons on radical self care from cats. This entry was posted in Uncategorized, webcomic and tagged cat, cats, comic, flowers, kitty, love, self care on February 24, 2017 by littledragonblue. The dilemma is real, the struggle eternal. Fortunately, the kitty flow chart is a simple one. Apparently, my genius cat, whose terrible behavior has been documented elsewhere in this blog, decided to swipe at The Man because–get this–he stopped petting her. You can’t win with cats. And yet, just as I’m sitting here writing this, she politely tapped on my hip to signify that she wanted to sit on my lap. So I should change my posture to accommodate that fleeting desire. Which lasted all of 25 seconds. Now she’s sitting on the desk looking suspiciously like she’s going to knock a mirror on the floor. I should take care of that. 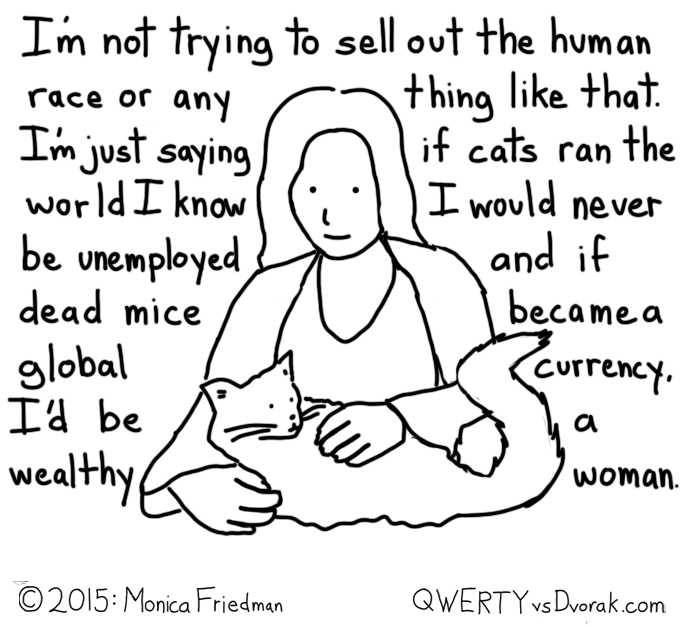 In the meantime, you can consider buying my book, supporting my Patreon, or ordering my merch. This entry was posted in webcomic and tagged cat, cats, comic, kitties, kitty, webcomics on August 9, 2016 by littledragonblue. Cats recognize faithful servants and reward them well. Last night, as I was getting ready for bed, I walked through a darkened hall and stepped on something cold and slightly moist with my bare foot, and I knew exactly what had just been squished beneath my naked skin, because I’ve stepped on dead mice before. The cat helpfully leaves them in my path, on the only rug in the entire house, because, despite the fact that I feed her regular food and treats every day without fail, she apparently considers me a terrible hunter. The mice are pretty easy targets; they live in the compost heap and even I’ve killed one (by accident, with a pitchfork, while turning the pile). I can’t get myself worked up over mice living in the compost heap–they’re kind of cute when they’re alive, and even though my neighbor in convinced they probably carry the hantavirus, the heap is a pretty safe distance from the house–but the cat is vigilant about their community, and spends many hours a day sitting on the wall, gazing down at their home with dedication to an ultimate goal. The dead ones are better than the disabled ones. In her quest to teach me how to hunt, she tried bringing me creatures with broken backs, still alive, but unable to walk. She must be perplexed when I let The Man finish them off for me. He grew up on a farm, and has more experience killing animals. In addition to mice, she has gifted me with many lizards, a sizable number of songbirds, and on one memorable occasion, a snake. It was a worm snake with a broken back, able to dart its head around, but paralyzed on the back end. To her credit, we had a terrible cricket problem in here before she decided to move in, and, mysteriously, since her arrival, the house is no longer infested with crickets chirping their heads off all night in the walls. In case it’s not obvious, this is another insomnia comics. Insomnia comics are drawn the night after insomnia, when the gears of my mind are sticky and don’t want to turn. I’m sure plenty of funny things happened today, but they didn’t want to be comics. There was the mom pushing a kid in a stroller even though that kid was clearly old enough to walk, and threatening to take away his dinosaurs every time he made a sound even though we were in a room full of screaming kids, for example. That’s weird, right? But I’m too tired to make sense of it. Oh, and then there was a conversation I had with my 86-year-old grandmother, during which she made fun of climate change deniers. And at dinner, we bumped into some friends we hadn’t seen in a while, one of whom is a physicist, who told me that his Ph.d. thesis disproved the concept of teleportation. There’s got to be a joke in that somewhere. Maybe tomorrow I’ll remember how to be funny. Right now I’m just kind of stressed out. This entry was posted in comic, webcomic and tagged animals, black and white, cat, cats, comic, insomnia, servitude, silly, sketch, webcomic on November 4, 2015 by littledragonblue. What the heck are *you* guys looking at? 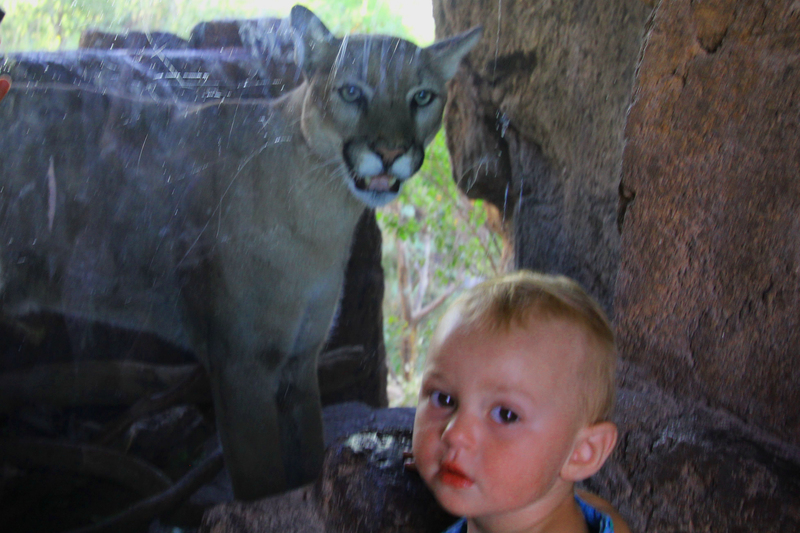 There is something, to me, unspeakably comical about this photo of a baby and a mountain lion. The mountain lion is real and alive, behind a thick wall of plexiglass. This mountain lion is relatively young; I remember he came to ASDM when he was still a cub, and he was very active, pouncing all the vegetation in his habitat flat. Once, a couple months ago, a dove flew into his enclosure and he stalked it for a good 5 minutes. He looked just like an enormous house cat: chest down, tail up, hips twitching. However, he didn’t have the slightest clue how to hunt. While a group of humans waited in anticipation, cheering him on (did you know in America it’s illegal to feed live animals to other live animals for spectators who have paid to be there?) he slowly crept forward and then, still a good 15 feet from his prey, pounced. The humans sighed and laughed. Undoubtedly, that mountain lion would pounce that baby if he found it in his habitat, but since it’s at the window, the mountain lion is used to just looking. Anyway, I know it’s not the best photo I ever took, but none of the other ones from that shoot really blew me away, even when I cropped them. This is the most interesting one from that day. I think I’ve finally come through to the other side of this sinus infection. Hallelujah! I woke up this morning only slightly congested, took a handful of OTC meds, and was basically able to breathe all day. It’s a modern medical miracle. Last night I seriously thought I was going to have to live with impacted sinuses for the rest of my life. Although I have a zero percent chance of finishing my entire list tonight, I got through a good part of my week’s goals. There’s one more project I can squeeze in tonight. This entry was posted in photgraphy and tagged animals, baby, cat, funny, mountain lion on October 23, 2015 by littledragonblue. I discovered this joke in a Garfield comic. Just kidding! No one’s ever found a joke in a Garfield comic. I don’t believe in holding historical figures to our modern standards, but I also don’t believe in celebrating shameful chapters of history. It’s important to study the past from every angle and to acknowledge the parts of it that make us uncomfortable along with the parts we want to glorify. There was a bravery to the life of Christopher Columbus, the explorer, in sailing across the ocean in a direction that none of his people had ever sailed before. Columbus was acting in accordance with his time and his station in life, and according to the morality of his culture; by the standards of the time, he deserved glory and accolades for his success. Yet, there can be no bravery in the exploitation of people who couldn’t compete with him in terms of weaponry, and were unaware that his overtures, designed to gain their trust, did not reflect truly friendly intent. There’s no honor in being the progenitor of the American slave trade. We can’t hold Columbus entirely responsible for the genocide on the mainland, and yet his arrival in the western hemisphere still marks the beginning of the subjugation of native people in the Americas by white people of European descent. It’s 2015, and I don’t think we should be teaching schoolchildren a happy cartoon story about what happened in 1492 without discussing the enslavement and eventual murder of most of the continent’s original occupants. I don’t think we should celebrate Columbus Day as a national holiday. I think it’s a lot more honest to celebrate Indigenous People’s Day and talk about what really happened, even if it makes us uncomfortable. I like a day off as much as the next person. It just seems like we should be more careful with our shared history, and more conscious of how our decision to frame that narrative reflects on our culture, and on people who continue to experience racism and oppression as a result of the brutality of history. 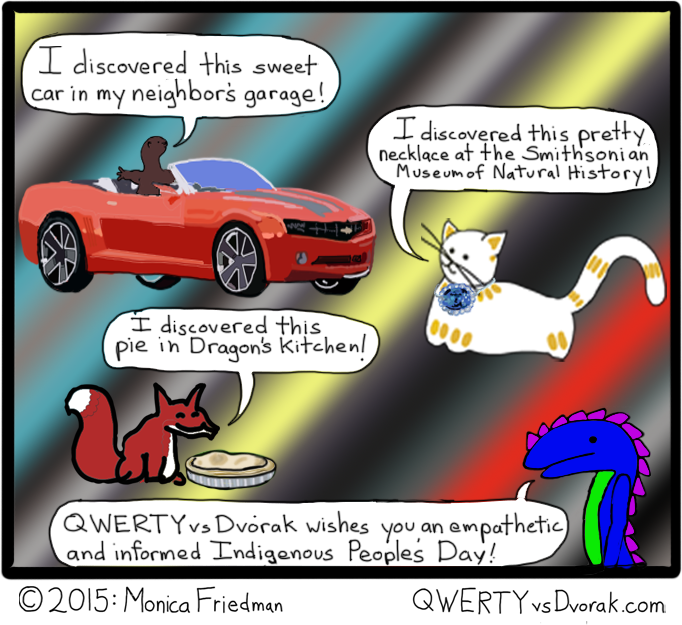 This entry was posted in webcomic and tagged cat, columbus day, comic, convertible, dragon, fox, hope diamond, indigenous peoples' day, otter, pie, stealing, theft on October 12, 2015 by littledragonblue.